Perhaps it is something to do with that famous national surname shortage. Whatever the reason, there is no greater compliment in Wales than to be known simply by your first name. No rugby fan needs telling who Gerald, Merv, Gareth and Barry, Ieuan or Jonathan are - or who Clem and Carwyn were. Nor for more than 60 years has any further clarification been needed for Bleddyn. Bleddyn Williams, who died on Monday at the age of 86, left such vivid memories in those who watched him in the first decade after World War Two that he is the one player from the pre-television era routinely selected for 'All-time' Wales XVs. The recorded images may be fewer, but those fans watched with a fervour - and in numbers - rarely equalled since, as if to make up for the six years lost to war. A generation of Welsh schoolboys grew up wanting to play centre like Bleddyn, but his fame extended far beyond Wales. At the 2006 Heineken Cup final Irish actor Peter O'Toole said that he had been awestruck to be introduced to Bleddyn Williams. It is no ordinary rugby player who strikes awe into Lawrence of Arabia. He is described beautifully in that finest of rugby books, Fields of Praise: "A hefty 13 and a half stone packed into 5foot10inches, a face like a well-inflated football, a torso like a tree-trunk and the muscular thighs of a Renaissance sculpture." He was famed above all for his jink: "He elevated it to such an art that it became a species separate from the sidestep…it meant coming almost to a temporary halt. Its essence was positional and psychological, whereby one drew the opponent into knowing the jink was coming, though when it did come he was helpless to do anything about it." Statistics do him little justice. Twenty-two Wales caps, plus five more for the Lions, and eight tries looks modest by modern standards. He played, though, in a time when four matches per year was the norm, and but for war and injuries would easily have doubled those totals. His almost exact contemporary and rival for the Wales captaincy John Gwilliam recalled him as a teenager: "I've never seen anything like Bleddyn at 18 or 19. He'd got it all - speed off the mark and perfect passing, kicking and sidestepping. He was quite alarming really." It was those talents that had won him, son of a Taffs Well coaltrimmer who produced eight sons who played for Cardiff, a scholarship to Rydal School - previously alma mater to Wilf Wooller - as a 14 year old. They propelled him into the Wales team for wartime services internationals as a teenage RAF man, twice scoring hat-tricks against England. He had a serious war as well - training as a pilot in Arizona before being 'volunteered' as a glider pilot after the carnage at Arnhem and flying through the Rhine operations. The first official cap, as an outside-half against England, did not come until 1947, when he was nearly 24. It was, though, as a centre and in partnership with the powerful, straight-running, crash-tackling Dr. Jack Matthews that he is best remembered. They were both a perfectly complementary centre pairing for Cardiff, Wales and the 1950 Lions and lifelong friends, until very recently to be seen together on most lunchtimes in the Cardiff Athletic Club bar. For Cardiff he scored 185 tries in 283 matches, including a club record 41 in 1947-8, but made many more. Gareth Griffiths, a team-mate for club and country, recalled him as an instinctive teacher, "He talked to you as you went along through the game." A natural leader on the pitch, he was the obvious choice to captain Wales after Haydn Tanner retired in 1949, but an ill-timed injury - one of a series that meant he played only two Five Nations matches in three seasons between 1950 and 1952 - meant that the honour fell to Gwilliam, just as much a natural but in a style sharply contrasting to Bleddyn's desire to 'play it by ear', as Wales won two Grand Slams in three seasons. 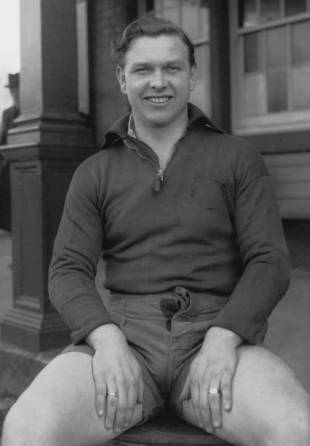 Still, he led the Lions three times in 1950, twice against New Zealand and once Australia, as deputy to Karl Mullen and captained Cardiff for two seasons. Wales won all five matches in which he was captain. The last few months of 1953 brought unmatched triumph as he led first club then country to victory over the All Blacks. Cardiff's win supplied one of the great images of his or any career, face glowing with triumph as he was chaired from the field, reproduced on the cover of Alan Evans' book Taming the Tourists. To be the last Welshman to lead his country to victory over New Zealand was a distinction he has retained for more than 55 years, and very much wanted to lose. After retiring in 1956 he produced one of the first rugby memoirs, Rugger My Life, and wrote for many years for the Sunday People. In the Welsh golden age of the 1970s he and Clem Thomas formed a fine critical double act on radio programme Sports Medley, always ready to point out where a good performance could have been improved. He lived on into a vigorous and genial old age - an invariably generous and friendly interviewee, albeit one so practised that one could occasionally hear passages from Rugger My Life being recited. He followed the Lions in New Zealand, where he was still recognised as one of the greats, in a campervan in 2005, drove to Twickenham and back for Wales's visit in 2006 and was still well enough only a few months ago to sit in the Twickenham press box and enjoy Cardiff's brilliant performance against Gloucester in the Anglo-Welsh Cup final. The last international he watched at Cardiff was Ireland's Grand Slam-clinching victory in 2009. Encountered afterwards he recalled that he played in the match that won their previous Slam in 1948, but characteristically omitted to add that he had scored a brilliant try. Once you knew him, he was far too warmly approachable to inspire awe, but anyone aware of his achievements knows what Peter O'Toole meant.